Home Entertainment Are You Curious About Park Hyung-sik’s Latest News? Park Hyung-sik is an idol/actor who was born on November 16th, 1991. He debuted in the entertainment industry as part of the boy group, ZE:A, under Star Empire entertainment, in 2010. His career has also expanded to acting and he is active as an actor who made his acting debut in the SBS special drama, titled I Remember You, in 2012. Park Hyung-sik has played in 16 dramas since 2012, including the super popular drama, starred by Lee Min-ho and Park Shin-hye, The Heirs! We know you are impatient to know more about the handsome idol/actor’s latest updates, let’s talk about it! This year, the actor is taking part in a new KBS2 drama, Suits, playing as Go Yeon-woo. The drama is of the legal genre and tells the story of Go Yeon-woo (Park Hyung-sik) who has a photographic memory that works as a parking valet to pay his grandma’s hospital bills. However, the money he earns is not enough so he decides to deliver drugs. When he’s on the way to deliver the drugs to a hotel, he realizes that he is trapped and he gets chased by the cops. Long story short, Go Yeon-woo manages to hide in a lawyer’s office that happens to be looking for a rookie lawyer. 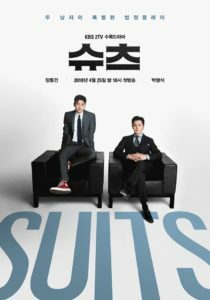 The lawyer is impressed by Go Yeon-woo’s memory and intelligence and he ends up being hired by the lawyer as a rookie lawyer, even though he has no law education background. This drama was aired in the middle of this year, from April 25th to June 14th. Have you guys watched it? Another drama Park Hyung-sik takes part in, only this time it’s not a TV drama, but a musical! Yup, Park Hyung-sik is also a musical actor and he has been playing in 5 musicals so far. He made his musical debut in Temptation of Wolves, back in 2011. The last musical he starred in was The Three Musketeers, where he played as D’Artagnan back in 2016. This year, the musical actor made a comeback with Elisabeth! This musical is based on a Viennese musical with the same title and the story is based on a story titled The Life of Empress Elisabeth of Austria. This musical made its premiere show more than 20 years ago, 1992 to be exact. In this musical, Park Hyung-sik is playing as Der Tod. Elisabeth is a musical that tells the story of the Empress of Austria, named Elisabeth or Sisi. She is obsessed with Death and the story is about her life since her marriage in 1854 until her murder in 1898, at the hand of an Italian anarchist, Luigi Lucheni. Another amazing thing about this musical is, Park Hyung-sik will be playing with the senior singer JYJ’s Park Jun-su! Elisabeth will open on November 17th at the Blue Square Interpark Hall in Seoul.